Surfer exports a map in map units by default when it is the only object being exported, and the map is not rotated or sheared. When other objects such as color scales and text are present, Surfer exports with page units by default, and you can change this to map units manually. If the map is rotated or sheared, there is no option to export in map units. Make sure the map is not rotated or sheared. Click Home | Selection | Transform, and set the Rotation and Shear values to 0. Click OK. Select the Map object in the Contents window and click on the View tab in the Properties window. Set the Rotation (degrees) to 0. Give the file a name, choose the desired file format from the Save as type list, and click Save. In the Export Options dialog, on the Scaling or Spatial References page, set the Scaling source to Map. 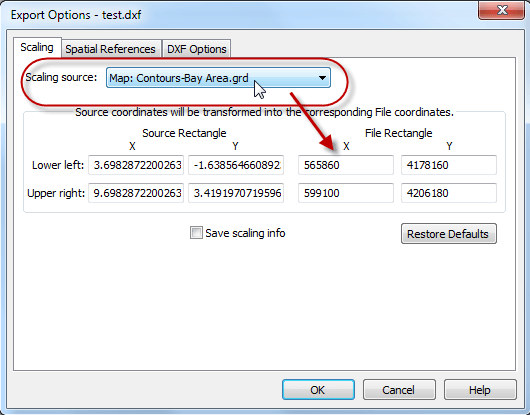 If you found this setting on the Scaling tab, the File Rectangle coordinates will update to be in the units of the map (different from the Source Rectangle coordinates). Click OK and the file is created in map units.